I hope it’s not just me. I hope that all of you, no matter where you might be, are seeing strawberries this gorgeous in your grocery store or farmer’s’ market. They are so lovely and flavorful, I can’t resist buying them! But that’s okay, because at least down here, they’ve been remarkably affordable, even the organic variety (strawberries are one of those recommended “best to buy organic” items). So, given the availability and seasonality of this particular item, we’ll be featuring a little four-part ode to strawberries here at Blue Jean Gourmet. Starting with dessert, of course! 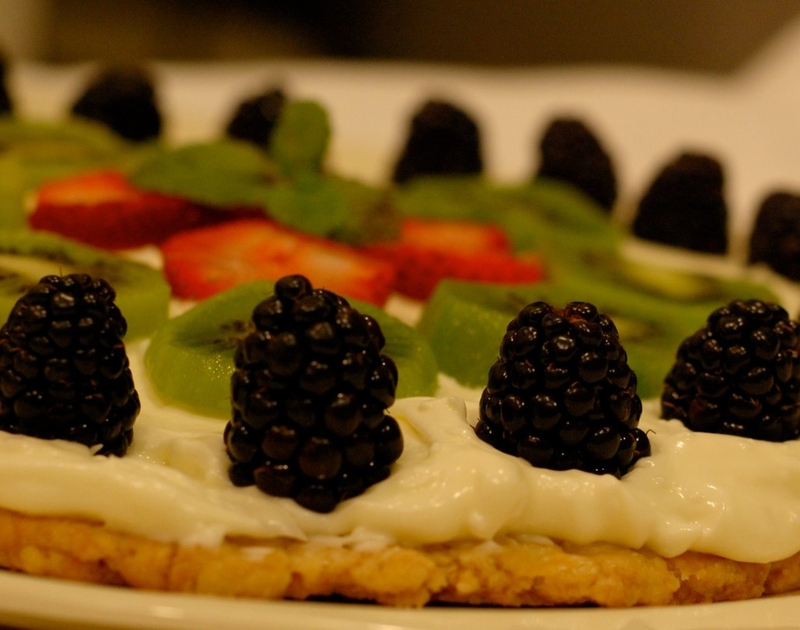 One caveat, though: making this fruit pizza may leave you feeling a bit like a charlatan. Why? Because, not to toot my own horn too much, but this looks hella impressive, right? Right. So imagine, if you will, taking this impressive fruit pizza to a summer potluck or dinner at your mother-in-law’s house and the “ooohs” and “ahhhs” and “wows” you will invariably receive. Are you imagining? Are you? Because here’s the secret about this dessert: it is dead simple to make. I know the concept of fruit pizza has been floating around for some time, and you may have had the misfortune of encountering a sketchy version made with big tubes of refrigerated dough & canned fruit or drowned in chocolate & marshmallow fluff. But don’t be alarmed! This one is elegant and not too sweet, perfect for summer months. You can even make the crust & filling ahead of time, adding the fruit and (optional) glaze just before serving. Fresh fruit is obviously the star of the show, so make sure that you buy good-quality stuff. I recommend erring on the side of firm when making your selections, so that the fruit will hold its own. Buy whatever is seasonal and looks scrumptious—I’ve made this with nectarines, peaches, kiwi, apple, mango, & all kinds of berries. blackberries are very photogenic, don't you think? This is also the perfect dessert to make with and serve to kids. Little hands can help press the dough, spread the filling, and arrange the fruit. Having a slumber party? Get the kids going in the kitchen; divide up the dough and let each child make his or her own mini-pizza. Hey, it’s healthier than most midnight snacks! Last but not least, I recommend this dessert as a great choice for diabetics or anyone cooking for a diabetic. You can easily substitute Splenda for the sugar in the crust & filling, and use sugar-free fruit preserves for the glaze. I did this for my friend Aisha’s dad at his birthday party, and he loved it. Coming next in our Strawberry Parade–a fresh, easy strawberry salad, strawberry-basil margaritas, & homemade granola with fresh strawberries. Tell us, how do you like your strawberries this time of year? Mix all ingredients by hand and press out onto a baking sheet, about 1/4 inch thick—you can do a traditional circle shape, a free-form oval, or a rectangle. Part of the appeal is the rustic look, so don’t worry about it being perfect. Bake for 20-25 minutes, until the crust is golden brown around the edges. Cool completely before topping. You can easily do this by hand, but use a stand mixer if you have it. Whip cream cheese until fluffy (if employing elbow grease, use a spoon for this part). Add sugar and mix until well blended. Finally, pour in the cream and whip until thick (at this point, switch to a whisk). It may take a minute or two for the mixture to set up, but it will thicken very quickly, all at once! Spread mixture evenly over cooled crust. Have fun with this part! The whole idea of this dessert is that the fruit speaks for itself, so let it show off a little. You can go for concentric circles, like I have here, but you can also just chop up the fruit and sprinkle on top; it’s going to taste just as delicious. If you have a tiny sous chef helping you, arranging the fruit to form a face or a flower or a star can be a lot of fun. Heck, that could be fun even if there aren’t any kids in the picture! Heat all ingredients a small saucepan, stirring well. Simmer for 2-3 minutes until the mixture has thinned. Spoon over fruit. you'll wow 'em with the finished product! i will always love fresh, ripe strawberries best sliced, in a bowl with milk and sugar. i loved them that way as a child. Awesome recipe! Britt and I tried it the other night and it was so good. We made it with pears, tangelos, and strawberries – the tangelos and strawberries worked out the best. L, yum–glad you tried & enjoyed. anytime you want to guest-post one of your baking adventures, let me know! Neeeeeshta – I made this for Poker Night last night, and it was a hit – but my filling never got thick looking like yours – is it possible I overwhipped it? It was delicious and gooey, still, but it didn’t quite look like yours, so I thought I would ask. hey Ms. Megan–I’m so glad you are trying so many BJG recipes & they are getting good reviews! thanks so much for your feedback. as for this fruit pizza filling, I’m not sure why it didn’t set…a few thoughts are 1) to make sure the cream cheese is well-whipped by itself before adding the cream, 2) to make sure the cream is as cold as possible before whipping, and 3) to just be patient & beat at high speed towards the end. Sometimes it takes a while for the cream to set up, and you kind of have to work up to it. But, in my book, if it tasted good, then it was a success! Aha! I think it must have been the temperature of the cream – I set it out on the counter for a while beforehand, so it was probably closer to room temp than fridge temp (and I did whip the cream cheese a lot and beat at high speed, so I don’t think I erred there). Thanks for the help! One more useful tip I can use in the future! On to the muffins this afternoon – my bananas finally ripened!